Ugly Christmas Sweater + Billie Jean = Can Not Look Away - Are You Finished Yet? How ugly are your appliques! I’m not sure if you are aware, but December 12th is National Ugly Christmas Sweater Day. No, you shut up. It really is. At least, it is according to the “Make the World Better with a Sweater” campaign by the decades old organization, Save the Children. And if people who have been responsible for improving the lives of kids all over the world since 1919 want me to wear an ugly Christmas sweater, I’m going to wear an ugly Christmas sweater. And I’m going to thank Meredith over at Pile of Babies for alerting me to fact that this day even existed. Because if there is anything I love more than wearing my “Bah Hum Pug” sweater vest, it’s helping out kids who are way cuter than it. So here is how it works. On December 12th, you wear your ugliest of ugly Christmas sweater all the livelong day. Like, everywhere you go. (I bet all of you who have a trip to Walmart on your agenda just breathed a little easier, because you know nobody is going to even look twice at you there. Those of you who have a job interview scheduled, well, you’ll get ’em next time, Tiger.) Then head over to Save the Children and make a simple donation of $5 or more to help support them in their good works. It is the season of giving after all. In addition, I will donate a portion of the proceeds from all copies of Absolute Mayhem that are bought on December 12th to Save the Children. You can find it at kellysuellentrop.com or on Amazon. So go forth, my children. Be ugly. Save a child. 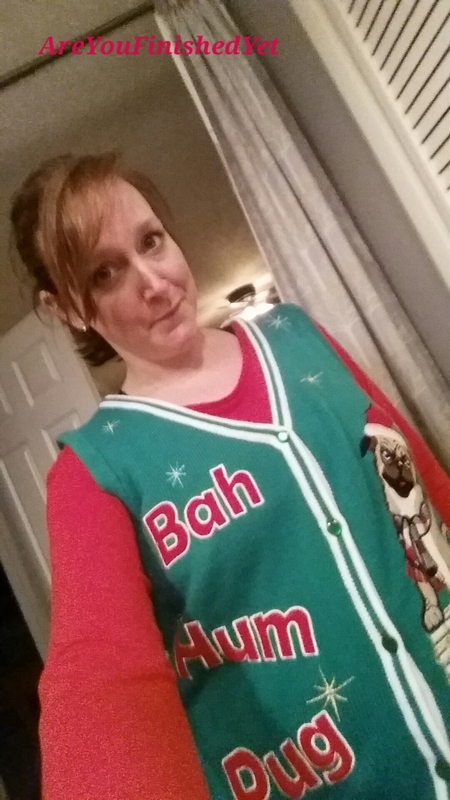 I think that’s s great sweater but I am a pug lover. I would have to go to the thrift store and BUY myself an ugly sweater! the 80s have been over with for a very long time! Shut your mouth. The 80’s are never over. “Go Forth, Be Ugly, Save a Child” may just be the best line EVER. Ha! I’ll put it on my resume. Heading over right now to donate! Even though I don’t own an ugly Christmas sweater. They’re funny and cute on thirtysomethings, just sad and pathetic on sixtysomethings. That video just made my day. You got the moves like Jackson. Sweet. I think I’d rather have the moves like Jackson than the lips like Jagger. The only thing I’d take of Jagger’s is his money. Let me just say this: That video was my treat for the week! Love, love, love! Ummm…..my favorite part was learning about the other vids. My favorite? Well, I’m not Your Live-In Maid, of course! You enjoy a level of fun that few achieve in marriage, child-rearing, life…..and for that – you earn the right dance in an ugly sweater to Billie Jean without shame! You go girl! PS – My Van is Stacked ran a very close second. 😉 You’re very cute…makes me wish my mom had been cool. Well, I’m not so sure my kids think I’m cool. But that’s okay with me.